Despite its title, The Town That Was Murdered by Ellen Wilkinson was not a detective story, but a condemnation of the economics that closed a shipyard and turned the south bank of the Tyne into a Distressed Area. She wrote it after becoming MP for Jarrow in 1935. The Division Bell Mystery was written earlier, while she was out of Parliament, having lost her seat in Middlesbrough in 1931. 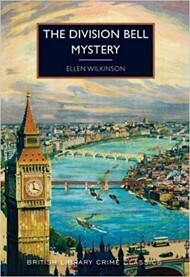 Although the Mystery features a woman Labour MP, she is not the main character, and Wilkinson’s amateur detective is Robert West, a Conservative MP who serves as Parliamentary Private Secretary to the Home Secretary. If Wilkinson is to be believed then such a position required little political knowledge, little interest in public affairs, and could tolerate an astonishing level of immaturity. The Division Bell Mystery is a locked room case. The Home Secretary and guest have been dining together in the Houses of Parliament, when the politician has to go to vote in the lobbies leaving his guest alone, while many individuals pass in the corridor to confirm that no one disturbed the lone diner. Hearing a gun-shot, Robert West and others enter to find the visitor dead, a pistol on the floor, and no murderer. When the victim is identified as a wealthy but hermit-like financier who had been brought in as the government needed a large loan, questions begin to be asked about said government and why negotiations were not being made publicly. Wilkinson plays some of the parliamentary debates very cleverly, paying attention to the rules which mean that the crime itself cannot be discussed. Meanwhile, Robert West goes backward and forward, scarcely knowing what he is doing, probably being manipulated by his minister, as well, from the head of the Civil Service. The murder of the dead man’s valet and theft of his papers seed more confusion. To cut to the chase, the means by which the murder was accomplished has been criticised as weak in histories of crime fiction, in the way the mortal revolver was fired. On the other hand, Wilkinson has played very cleverly with forensics up to this point, in identifying the difference between suicide and murder, and then with the strange history of the fatal bullet. Assume that her “revolver” (other authors of the period tend to confuse revolvers and automatics as well) is an infernal device, made for the purpose (and the story allows that), and this becomes not just a good mystery, but an infernally good one. For a radical MP, and one who was a great publicist for the struggles of her constituents, Wilkinson may seem too sympathetic to Robert West, yet anyone who has followed the financial shenanigans that have gone on since 2008, possibly before, will recognise the levels of financial incompetence, secret loan making, attempts at manipulation by big business and both the members of the government and the civil service for short term benefit (not to recognise that this is how too much of our nation is governed even today). And odd that Wilkinson should be able to make it so readable.